The statue is twice as old as the Egyptian pyramids, and contains arguably the most ancient coded message on the planet. The Shigir Idol, is estimated to be 9,500 years old and is regarded as the worlds most mysterious object. It was made during the Mesolithic period, around 7,500 BCE but was only discovered in 1890 in Kirovgrad, Sverdlovsk region, in the Ural Mountains. The statue is currently displayed in the “Historic Exhibition” Museum in Yekaterinburg, Russia and is guarded 24 hours a day by Russian special forces. The idol was discovered on January 24, 1894 at a depth of 4m in the peat bog of Shigir, on the eastern slope of the Middle Urals, approximately 100 km from Yekaterinburg. Investigations in this area had begun 40 years earlier after the discovery of a variety of prehistoric objects in an open-air gold mine. It was extracted in several parts; professor D. I. Lobanov combined the main fragments to reconstitute a sculpture 2.80m high. In 1914 the archaeologist Vladimir Tolmachev proposed a variant of this reconstruction by integrating the unused fragments. Some of these fragments were reported lost, so only Tolmachev’s drawings of them remain. Since 2003 the sculpture has also been displayed in a glass box filled with inert gas. No consensus exists about the meaning of the motifs, or what the sculpture represented. Claims have been made that the motifs refer to aliens or gods. Now Russian experts say the remarkable relic contains encoded information on the ‘creation of the world’ – a message to modern man from the Mesolithic era of the Stone Age. 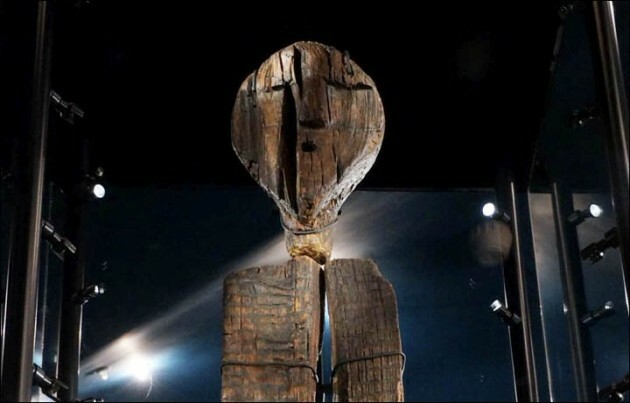 The Shigir Idol is thought to be the most ancient wooden sculpture in the world. It stands 9.2ft (2.8 metres) in height but originally was 17.4ft (5.3 metres) tall, as high as a two storey house. 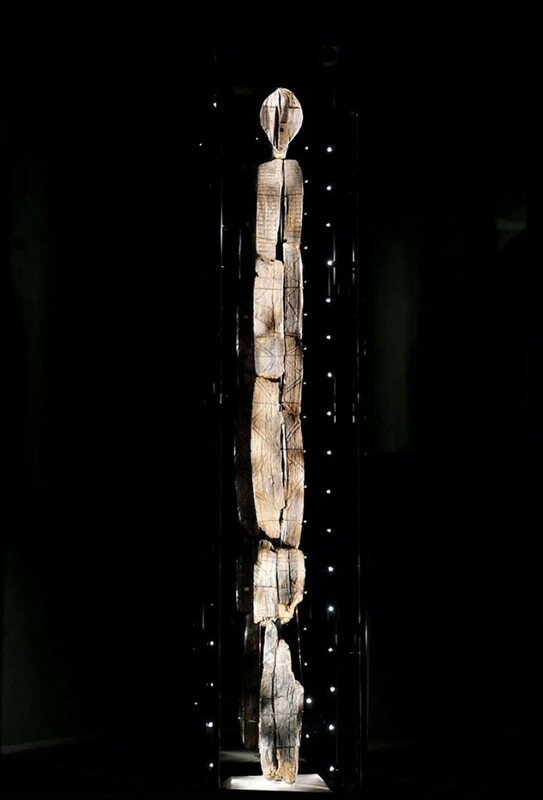 Almost 6.5ft (2 metres) of the artefact went missing during Russian’s 20th century political turmoil, though Siberian archaeologist Vladimir Tolmachev drew images of all the pieces. The messages carved into the ornament ‘remain ‘an utter mystery to modern man’, according to experts. Some say the straight lines could denote land, or horizon – the boundary between earth and sky, water and sky, or the borderline between the worlds. A wavy line or zigzag symbolised the watery element, snake, lizard, or determined a certain border. The faces may be images of spirits that inhabited the human world in ancient times.